Are You OK With Nintendo's Fire Emblem DLC? The gaming world is not yet in agreement about all of the right ways and all of the wrong ways for game companies to do downloadable content. Should a company charge several dollars for horse armor? Probably not. For costumes in a fighting game? Hmm. Should the DLC never be on the disc even if it ensures better multiplayer compatibility? Does the DLC need to be made only after the game is done? Should it come out within six months after the release? More? Less? If a company (Nintendo) makes a large game (Fire Emblem: Awakening on the 3DS), sells it in Japan in the spring of 2012, then sells a variety of downloadable mission expansions in the months that follow and then that game is brought to America nearly a year later... should the DLC even still be DLC? Should it be on the cart? Should it be free? Or is it cool for Nintendo to charge extra if the base game is still well worth the game's asking price? You can answer this question now. Or you can answer this question next month when Nintendo releases the turn-based strategy game Fire Emblem: Awakening on 3DS and then begins doling out translated, localized versions of the same DLC it sold for the game in Japan last spring. Awakening, by all accounts, is a big, good, complete game. It costs $40. Downloadable Content: Maps will be available to purchase and download starting on launch day, and others will be distributed regularly. The first downloadable map will be available for free for a limited time only and will serve as an introduction to the steady weekly stream of additional maps. The additional maps will be offered at different price points. 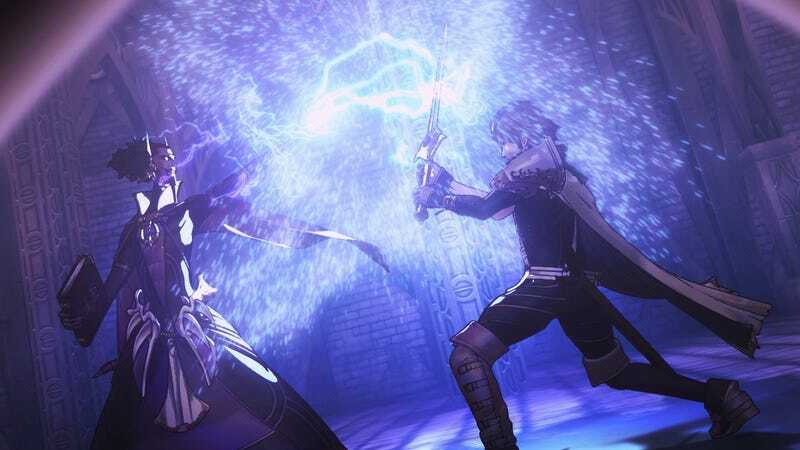 Players with a copy of Fire Emblem Awakening and a broadband Internet connection will be able to access the downloadable content through the Outrealm Gate located on the in-game world map, which will be unlocked after the player completes the fifth mission in the main story mode. The content will include additional information about new class types, skills, playable characters, maps with new storylines and special maps that let players earn more experience points, gold or other rare items. SpotPass: In addition to content that can be purchased from within the game, Nintendo will also distribute new content via SpotPass for free. SpotPass content will be distributed in the launch time frame and will feature new maps with new storylines, characters and items. Iwata never said Nintendo would not issue paid DLC, and, sure enough, that's what they'll be doing with Mario. Nintendo simply won't do it crassly, Iwata promises. "I think, when the player has exhausted what's in an existing piece of software, when there are no more challenges and there is nothing more they can do, if we then introduce a new level or a new character-something new for them-we just increased their motivation to want to go back; we've also increased the amount of time they're going to enjoy that software. And one thing Nintendo has determined as a company policy, what we are not going to do is create a full game and then say, ‘let's hold this back for DLC.' That's not our plan. We're definitely not doing that. It's an extreme example, but I think there are examples of games where you get that initial purchase-the very core part of the game-and everything else around it is all DLC. However, if you do that I believe customers will have no motivation to go out and buy the retail package to begin with. "So our goal is to create DLC in such a way that consumers do not feel that they have been cheated or deceived. Now I believe there are people out there, readers, who have are worried about that, and we just want to ensure them that we have that in mind and want them to know that that's not what we are planning on doing." Non-Nintendo developers have pointed out to me that companies budget for games and their DLC separately and that for business reasons they often need to charge for that DLC no matter what. It costs money to make it, of course. There's also an interesting precedent set by Nintendo themselves on the DS and 3DS with Level 5's Professor Layton series, which had been offering players weekly free, downloadable puzzles until the 3DS edition, which has instead been doling out free daily puzzles. One could debate the holding back of content there vs. the doling out to players of a drip-feed of amusement. So... what's your verdict on this one? Or is it too early to judge?